During the new and full moons, the moon, the sun and the earth are positioned in a straight line. Their gravitational and centrifugal forces interact with each other to create extremely large tidal ranges in the sea. 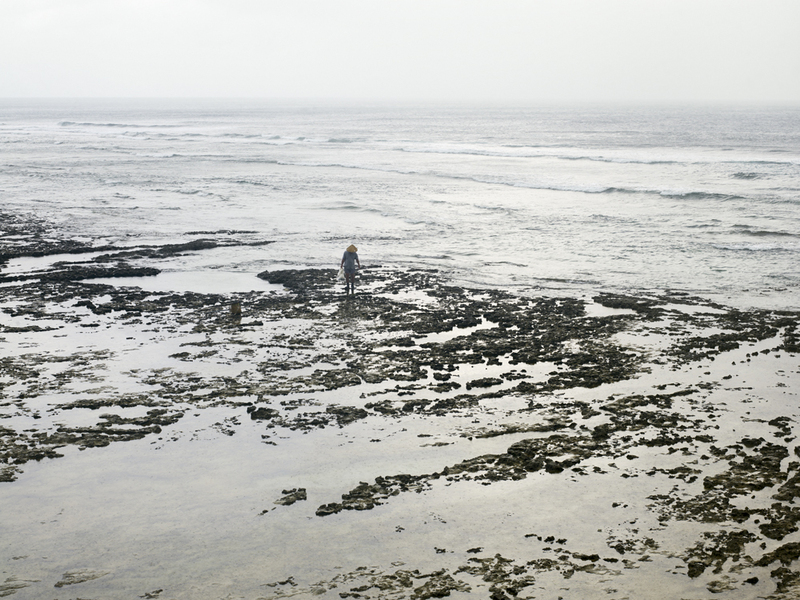 Low tide reveals fantastically shaped rocks and coral, the broad seashore taking on a semblance of the land. Seawater runs through clefts in the rocks to create waterfalls. The dense growth of seaweed gives off the smell of the sea. A wind blows down from the lighthouse at the end of the promontory. After the silence of the slack tide, the water starts to creep back again, everything becoming hidden under the sea once more. If we visit the sea during high tide, we are able to experience the vast power of nature and the passage of time directly. It is as if our memories are wiped clean and we have been cast up on some unknown planet. The figure of an angler appears amid the spray of the waves on the tip of the headland. He swings his rod and casts his line. His whole being is focused on the slightest movements of the line. A splinter of sunlight runs down the length of the transparent line. The taut line corresponds with the invisible darkness of the sea. Even though it be for only a brief moment, the image of the angler is separated from past and future to become one with the sea.